The New Projects That I Promised! First, I would like to introduce to you Gretchen or Doll with Bear. She was created out of all cotton yarn, for her body and hair. The dress and bears are acrylic as are the shoes and hair ties. She has blue safety eyes, so they will not come off. Her nose and lips are embroidered. They are not perfect, but are any of us made perfectly? No, we all have flaws and true to life, my dolls are also flawed slightly. She is the first doll that I have made from this pattern. you can find it on amigurumiBB’s blog under Waldorf Inspired Doll. It is a free pdf file. 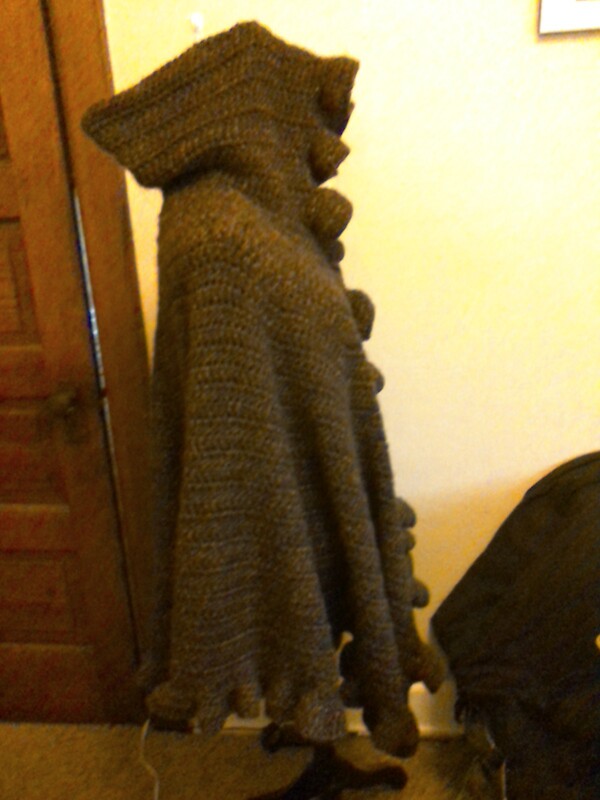 I really think Vanja, who is amigurumiBB, is so clever. Her designs are brilliant! And this is not false flattery. I crochet her patterns for dolls and she thinks of everything! For instance, the foot of this doll is more vertical than horizontal as a child’s foot would be; so she created the shoe to fit the foot exactly! So clever! So, if you would like me to make you a custom doll, just e-mail me at cabincrochetcreations@gmail.com! 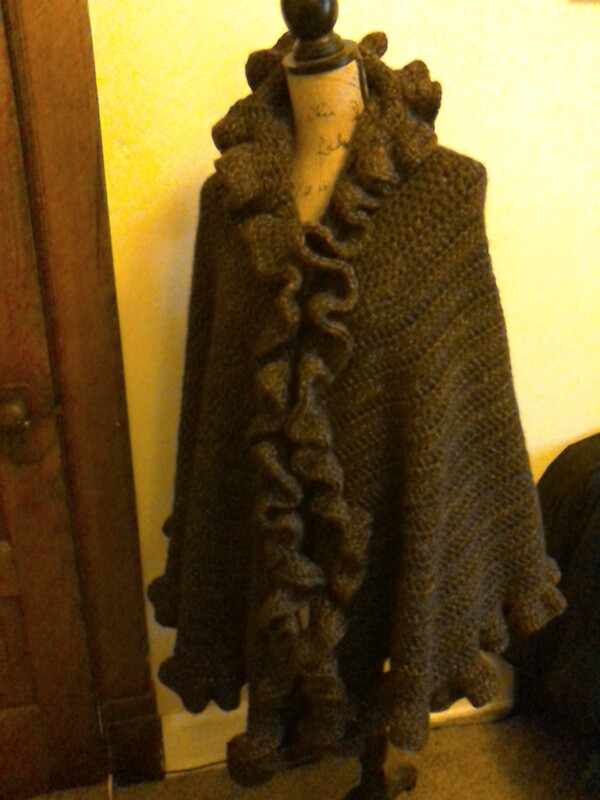 Second, I would like to show you the Ruffled Shawl/Cape I made from a Ravelry pattern by Linda Kay-Smith. I just call it my cape! I have always loved capes. When I was in my late teens I got a beautiful Admiral’s Cape from an Army/Navy Surplus store in the town where I was going to collage. There were two lion’s heads at the neck and a chain that hooked onto them both. It had a huge, deep pocket, on the inside and it was made from a thick, black wool. Do you think I liked it?! That was several lifetimes ago! I was very preppy in high school, but when I went to collage I turned into a rebel and wore only clothes (retro) from second hand stores. i wish I had a picture to show you but they have been lost along the way. So. back to this cape. 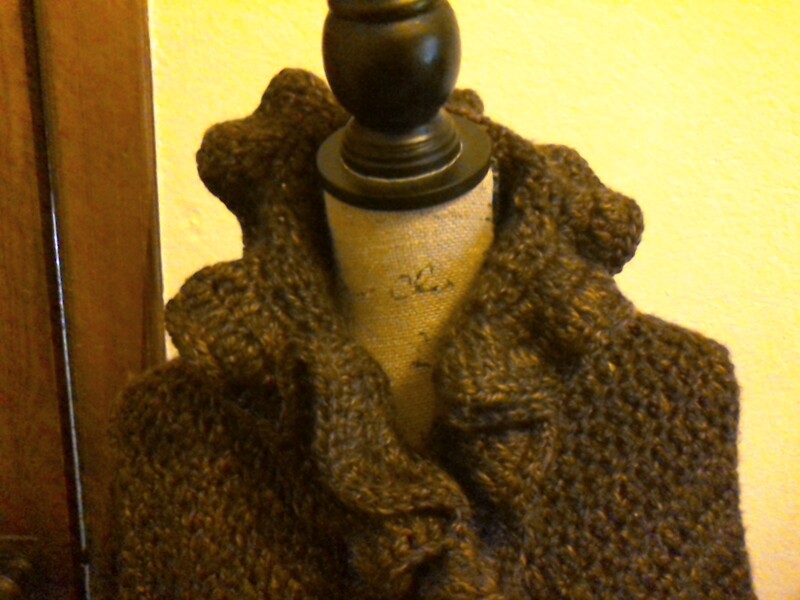 It was made from 16 skeins of Lion Brand Heartland Thick and Quick Sequoia. Since that is a lot of yarn, it is priced accordingly. I am going to be a part of the “Honeycraft Market” for “Groundhog Days” since I live in the town where the movie was filmed. I will have all my stuff for sale, including this gorgeous cape! Finally!! I can present to you, The Princess! She is inspired by “My Little Pony”‘s “Princess Celestia”! She took 20 days to make! That is SO long. For what I have sold her for I made less than $6/day and that is a 10-12 hour day! I am pretty impressed with her, if I do say so myself! 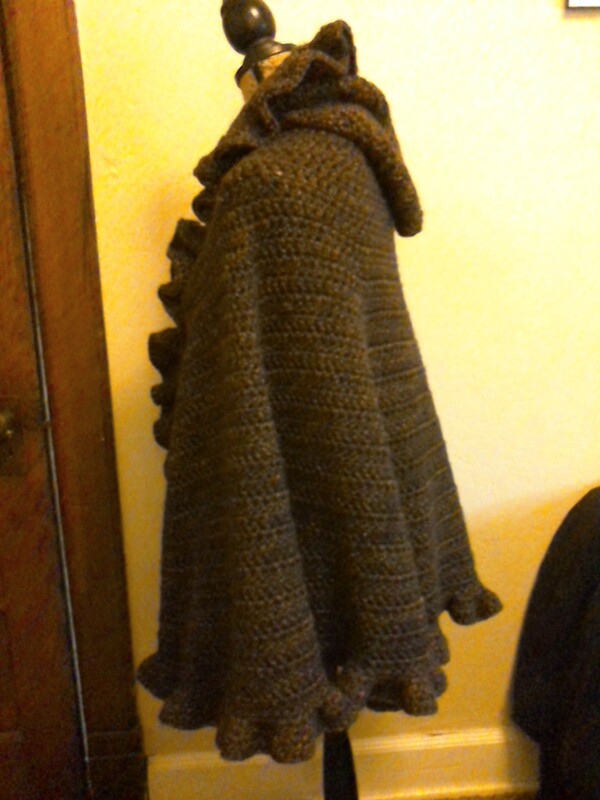 🙂 The pattern I used is complements of knitoneawesome.co.uk. I think CeeFax, the designer, is a genius! All of the “MLP” inspired characters I make are all her patterns. Pretty cool. If you would like to order one please e-mail me at cabincrochetcreations@gmail.com. So, even though I haven’t blogged in a while, you can see that I have been busy! Please come and see me Saturday January 30th at Mixn’ Mingle on the square, in Woodstock, IL for the “Groundhog Days” “Honeycraft Market”! 10 am to 4 pm! There is a Facebook Event posted under the above names and it has maps and pictures of some of the vendors wares that will be there. It will be fun! See you there! Have a safe and blessed time before I write again!